Each of their performances is a once in a lifetime event. “Rowdytown”...that’s what they call Big Gigantic’s homecoming event. 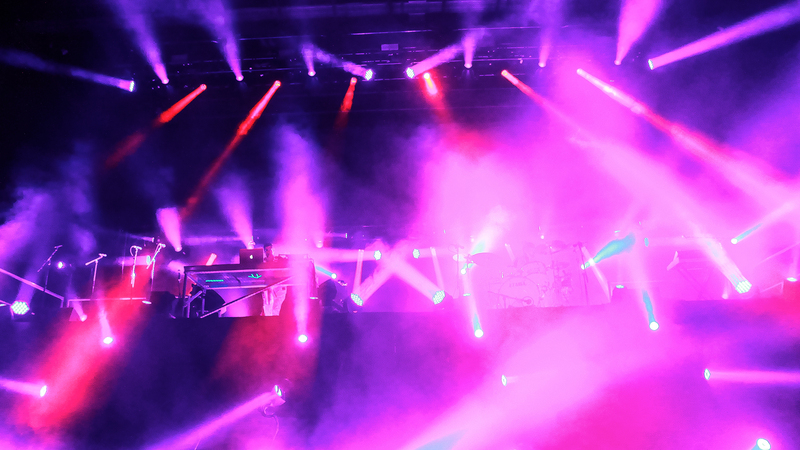 The pair were Boulder’s hometown heroes at the infamous and absolutely mind numbing Red Rocks Amphitheatre in Morrison, Colorado for two consecutive nights of pure electronic bliss at their own mini festival. The annual Rowdytown shows began back in 2012, when the duo sold out their first Red Rocks show. Since then the event has been a high point of every September in Boulder, Colorado. Combining sultry saxophone melodies and electronic beats, Big Gigantic's Dominic Lalli and Jeremy Salken are experts at creating the perfect soundtrack for an outdoor party. Joined by fellow DJs Marshmello and hometown favorite, Illenium, I got to experience the second night of this raucous party that seems to be an event every Coloradan has saved in their calendar, and it was a night unlike any other. Unlike most venues, the iconic Red Rocks is centered around bringing people together, not splitting them apart. Sure, there is a VIP front row but it’s only distinguishable by the thin and fraying rope loosely stretched around the perimeter. The rest of the bleacher seats are GA and have the aesthetic appeal of being set directly into the mountain stone. The view from the top is nothing short of surreal. Without any enclosures, you’re able to see the mile-high Denver skyline over the top of the stage, and if the hike up doesn't take your breath away, the view certainly will. As the night unfolded, Illenium demonstrated the mastery of his art. With his recent string of breakout hits all over the internet, the crowd was more than happy to sing and dance along with every beat he could throw down. Once Illenium had wrapped things up, there was a slight break before Marshmello took control. The great thing about DJs like Marshmello is that they have a look and style that their fans can imitate. His identity is still unknown, and with imitators having done such a detailed job with their own costumes, it was fun to imagine that he might be wandering the crowd himself. Having seen Marshmello only once before, I was incredibly excited to see how he would follow up his smashing sets at Lollapalooza and Ultra. He's always so in-tune with the energy of the night, and every time he picked up the microphone to give a shoutout, you could hear how out of breath he was. With the night growing colder each minute, it was easy to stay warm as the intensity of his set increased. I’m sure at some point they considered putting a “Caution: Falling Rocks” sign in the seats because that mountainside was shaking! “Big G” are a dark horse duo that have solidified their own niche in the EDM scene, with their latest release Brighter Future being no exception. The "All of Me" musicians' ability to incorporate live vocals and actual musical instruments into electronic music rivals the showmanship of the industry's biggest names. Watching them perform truly provides the sentiment of watching an artist create brand new music right in front of you, making each of their performances a once in a lifetime event. Two hours later, they wound it all down, surely leaving the crowd wanting more. And if they choose to put it all together again next year, I’ll gladly call myself a citizen of “Rowdytown”.